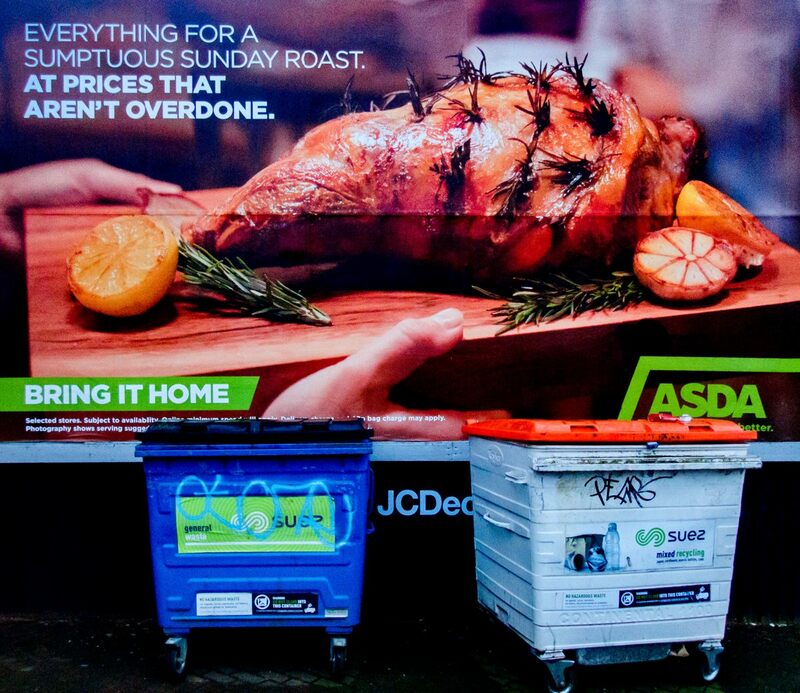 Modern Life and bins of by-products. There are earlier Modern Life posts here: 1 2 3 4 5 6 . Each will open in a separate window. The first image in the Outer Suburbs series, with context, is here: 1 . Subsequent images are here: 2 3 4 5 6 7 8 9 10 11 12 13 14 15 16 17 18 19 20 21 22 23 24 25 26 27 28 29 30 31 32 33 34 35 36 37 38 39 40 41 42 43 44 45 46 47 48 49 50 51 52 53 54 53a 55 56 57 58 59 60 61 62 63 64 65 66 67 . Each will open in a separate window. oh dear…the irony of it all. Well seen. Yes, irony; we share views, my friend. A group of people in Cardiff are trying to get a ban on moving picture advertising ‘boards’ in the city which I thought was interesting. Perhaps we’re reaching peak advertising. No: probably not! Yes, absolutely, that juxtaposition, two types of graffiti >>> that’s it, absolutely! Peak advertising, never! After all, advertising generates cash – nuff said! .. Normally prices are overdone..? Great shot! 🙂 I especially like the scale; the ‘sumptuous’ roast in comparison to the bins. Enjoy the pulsing! Your weekend can not go wrong.. 🙂 Cheers!